Monitors, otherwise VDUs (Visual Display Units), can get outdated pretty quickly. So if your desktop is getting a little outdated, the VDU that came with it probably already is. 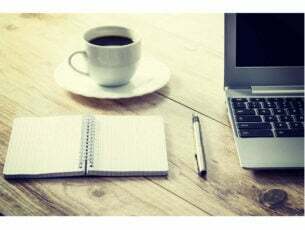 However, what monitor should you go for in 2019? Companies list various specifications for their VDUs. Resolution and refresh rate (otherwise the frame rate) are two of the more significant specs. A monitor with a higher resolution displays more pixels and has a sharper, more detailed picture quality. However, most higher-res monitors usually have lower refresh rates, which is an important gaming spec. A monitor with a higher refresh rate will have a better frame rate (FPS) for smoother gameplay. Another thing to note is whether a monitor has adaptive sync, which matches the GPU’s and VDU‘s frame rates to eliminate screen tearing. A monitor might have Nvidia G-Sync or AMD FreeSync for Nvidia and AMD graphics cards. Although they have the same effect, you must have a Nvidia graphics card for G-Sync and an AMD video card for FreeSync. A VDU‘s G-Sync will not work if you have a desktop with AMD graphics card. The diagonal width of a VDU is another notable specification. Of course, the bigger the monitor the better; but you’ll need extra desk space to fit a more expansive VDU. 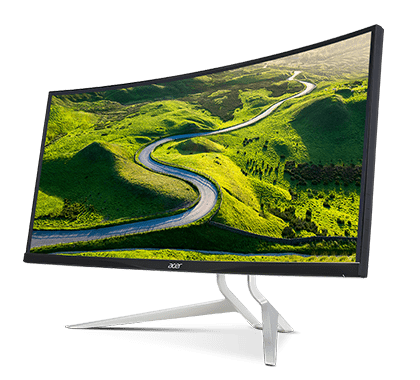 Some VDUs also have curved designs, which the companies that design them tell us gives the monitors a greater sense of immersion and larger field of view. Aside from that, panel type (IPS or TN), response time and aspect ratio are other VDU specifications worth noting. These are some of the best PC monitors for 2019 that generally have high specs. The Dell Alienware 25 is one of the hottest VDUs for gaming in 2018. Although the monitor has a relatively standard 1,920 x 1,080 resolution, it has a fantastic response performance. The 25-inch Alienware 25 boasts a 240 Hz refresh rate and a lightning one ms response time to ensure blur-free gameplay in games. Furthermore, the VDU has separate G-Sync and FreeSync models; so you can get one for a desktop with Nvidia or AMD GPU. There are also alternative 25 and ultra-wide 34.14-inch Alienware 25 models. As it’s the Alienware, Dell has given the VDU’s design an extraterrestrial theme. The Alienware 25 AW2518H model includes custom AlienFX lighting effects. That’s a customizable RGB lighting system that illuminates the back of the monitor. 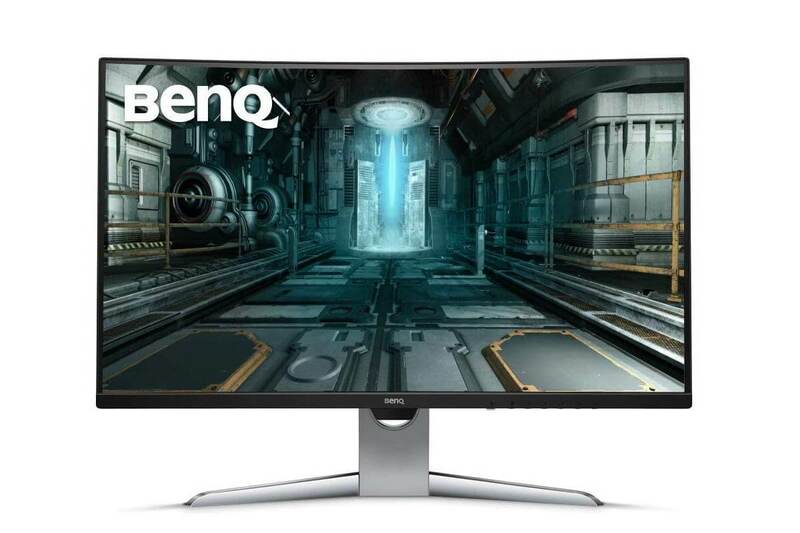 The BenQ PD3200U is a terrific design monitor that’s ideal for graphics design, animating and image editing. The standout specification of the BenQ PD3200U is its 4K 3,840 x 2,160 resolution that few other VDUs can match. This is an IPS monitor with a 100% sRGB color palette for stunning color precision. As such, the BenQ has fantastic picture quality; but with a 60 Hz refresh rate and four ms response time its response performance is not so strong. Another great thing about the PD3200U is its unique designer display modes. The monitor includes a CAD/CAM Mode that enhances contrast for lines and shapes, which is great for wire frame models. The VDU’s innovative Animation Mode lightens image areas with dark shadows. It also has a DualView mode that displays two modes side by side, or you can switch between the various modes by pressing a button on the VDU. 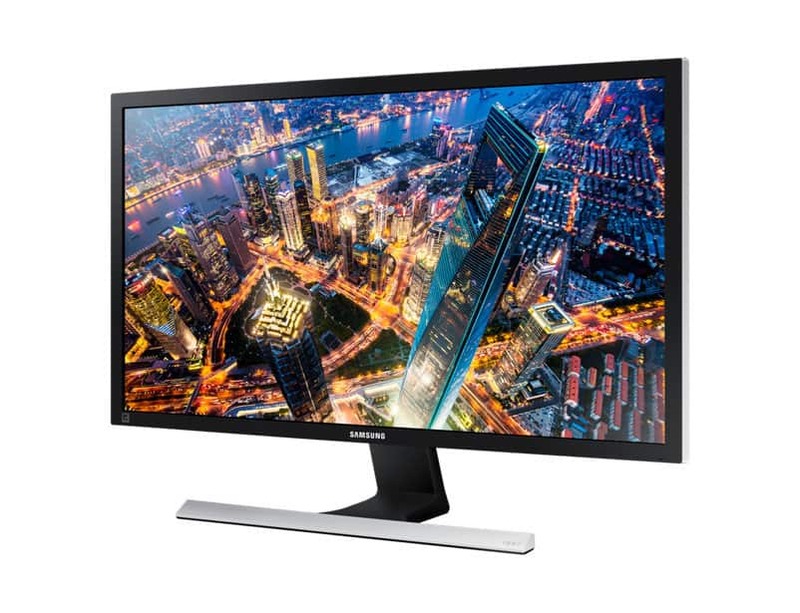 The Samsung U28E590D is a great value 28-inch 4K VDU that’s currently retailing at a discounted $309.99 on Amazon. This is an Ultra HD monitor that has a one billion color palette for more detailed picture quality. Samsung has also enhanced the VDU for gaming with the inclusion of AMD FreeSync to eliminate screen tearing in games. Furthermore, the U28E590D has a terrific 1 ms response time. As a 4K monitor it doesn’t have the best frame rate, but its 60 Hz refresh rate is still ok for 4K gaming. Aside from its great picture quality, the U28E590D also includes Picture-in-Picture and Picture-by-Picture viewing modes. With Picture-by-Picture, you can watch output from two input sources simultaneously. PIP 2.0 enables you to resize the second picture to fill only 25% of the VDU and then reposition it much the same as a software window. The Acer Predator X34 is one of the best G-Sync monitors for 2018 more specifically designed for gaming. With an IPS panel and QHD 3,440 x 1,440 resolution, the VDU has stunning visuals. 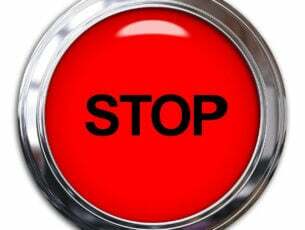 The X34’s standard refresh rate is 60 Hz, but you can overclock that frame rate to 100 Hz to reduce motion blur. This is a great monitor for watching movies as it has an expansive ultra-wide 34-inch display with a 21:9 aspect ratio that eliminates black bars from films. Furthermore, the Predator X34 has a unique curved design for greater immersion. The Predator X34 also has few novel features. The bottom of the VDU includes customizable underglow lighting effects. The X34’s GameView is another novel addition to the monitor with which you can set up aim-points for first-person shooters and adjust colors and dark boost levels for games. The Acer XR382CQK is the best of six Acer XR VDU models that are retailing from $569.99-$1,299.99. 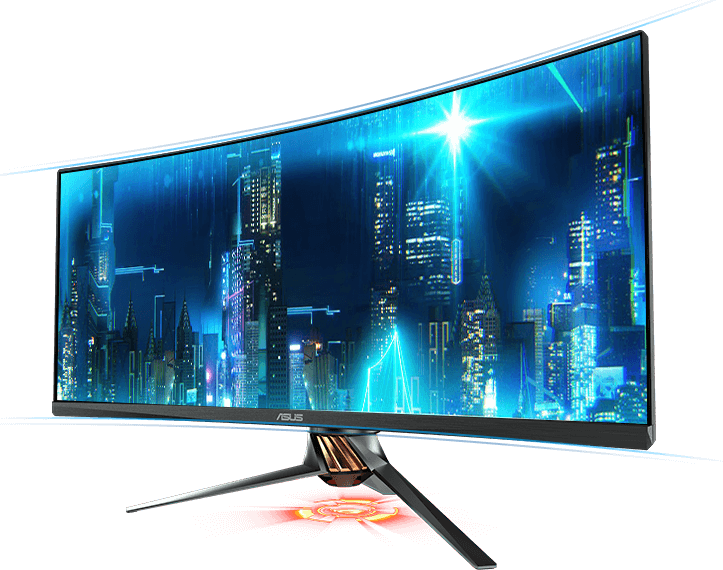 This is a gigantic curved ultra-wide VDU that expands 37.5 inches. The XR382CQK has amazing picture quality with an IPS panel display that boasts a 3,840 × 1,600 resolution, which is just short of the 4K mark. Its FreeSync eliminates screen tearing in games, and the VDU also has a 21:9 aspect ratio so you can watch 21:9 movies without black bars. This monitor also incorporates the HDR display technology for deeper levels of contrast. The Acer XR382CQK includes plenty of handy features and customization settings. You can select various pre-calibrated presets, such as Racing, Sports, Movie, Graphics, etc. The VDU includes PiP and PbP viewing modes much the same as the same as the Samsung U28E590D. In addition, the Acer XR also includes customizable LED ambient lighting effects that illuminate the VDU. So the monitor’s OSD menu packs in plenty of options. The 27-inch ROG Swift PG279Q is one of the best gaming VDUs for 2018 because it’s a monitor with great visuals and ultrafast refresh rate for seamless gameplay. This IPS monitor boasts a 2,560 x 1,440 resolution and 100% sRGB color gamut for stunning colors. With a 165 Hz refresh rate, the Swift PG279Q provides the smoothest graphics. This VDU also supports Nvidia G-Sync to minimize game lag and tearing. The ROG Swift PG279Q incorporates GamePlus and GameVisual settings to configure the display with. With its GameVisual settings you can select from six alternative display modes via the OSD menu. The GamePlus hotkey enables you to choose from four crosshair settings for games, add a timer to the display or check the configured frame rate with an FPS counter. 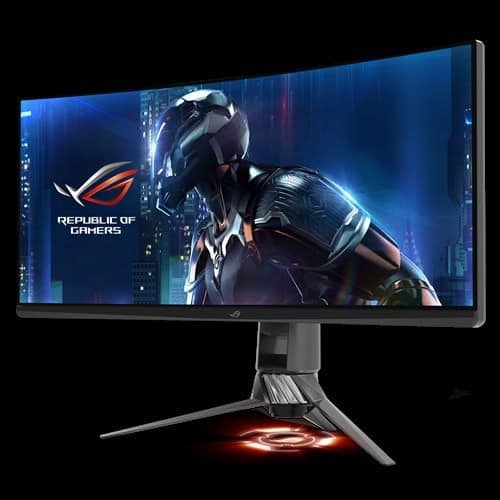 The PG348Q is the current flagship of the ASUS ROG Swift range and one of the best curved VDUs for 2018. The picture quality of the ROG Swift PG348Q is a slightly better than the PG279Q as it has a higher 3,440 x 1,440 resolution. Furthermore, this is also a more expansive 34-inch ultra-wide monitor with a 21:9 aspect ratio for greater desktop space. Of course, the better picture quality is compromised with a lower 100 Hz refresh rate; but that’s still a decent frame rate nonetheless. The ROG Swift PG348Q shares much the same feature set as the PG279Q. It includes the same GamePlus and GameView configuration options. You can also quickly adjust the frame rates for games by pressing PG348Q’s Turbo Key. Plus there are a good range of connectivity ports included on the VDU, which include four USB 3.0, one DisplayPort and one HDMI port. 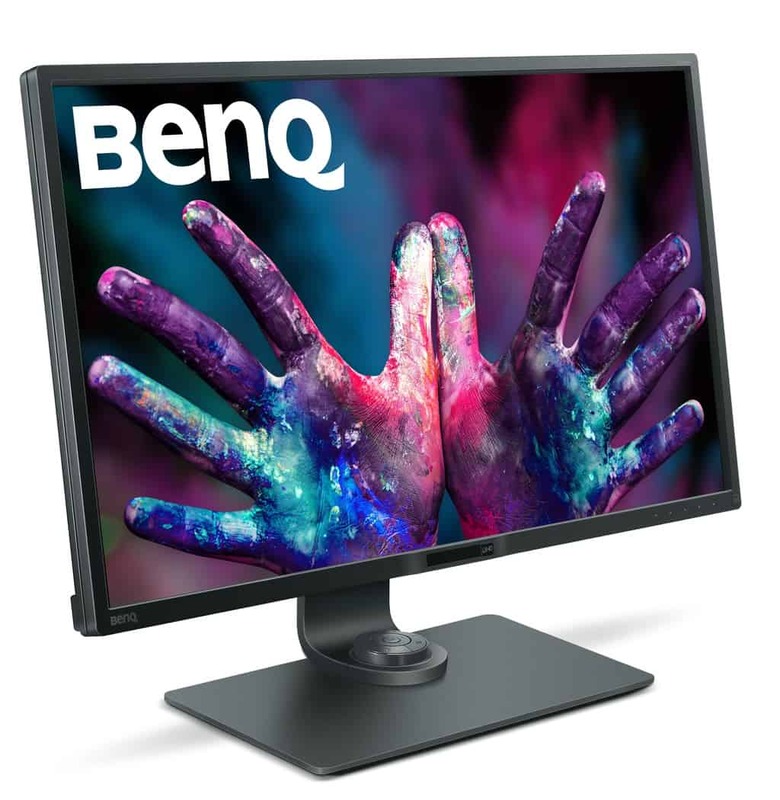 Another great monitor that we want to show you comes from BenQ, and EX3203R uses QHD 2560X1440 resolution which should be enough for most of your multimedia needs. This is a 31.5-inch device and thanks to the 1800R curvature, you won’t miss any of the action on the screen. The device also uses Display HDR 400 technology providing you with enhanced brightness and contrast bringing the smallest details to life. There’s also Brightness Intelligence Plus technology that will soften the bright areas slightly while keeping the dark areas sharp and clear. Speaking of colors, this monitor has ultra-high 3000:1 contrast which is three times higher than on standard panels. If you’re a gamer, you’ll be pleased to hear that this monitor uses FreeSync 2 technology that will offer smooth multimedia experience in HDR. Speaking of user experience, the monitor supports a 144Hz refresh rate, so you won’t miss any of the high-intensive action. It’s worth mentioning that BenQ EX3203R uses Eye Strain reduction technology that will detect ambient brightness and color temperature and adjust your color settings accordingly in order to reduce the eye strain. As for connectivity, this device has two HDMI 2.0 ports, DisplayPort and USB Type-C port, so you should be able to connect any device to this monitor with ease. Overall, BenQ EX3203R is a great monitor, and its only flaw might be the lack of 4K resolution, but if you’re not looking to enjoy in 4K multimedia, this monitor will be perfect for you. Aside from the monitors that are already out, there are also a few hotly anticipated VDUs scheduled for release in 2018. The Predator XB272-HDR was one of the most exciting monitors unveiled at CES last year, but Acer delayed its release for the first half of 2018. That will be among the first 4K VDUs with a 144 Hz refresh rate when it sees the light of day. As it also supports Nvidia G-Sync, the Predator XB272-HDR will be one of the finest 4K gaming monitor to date. The Predator X27 is another Acer VDU that’s pushing back the boundaries for 4K monitors. This VDU is set for a Q1 2018 release, and it has pretty similar specifications to the XB272-HDR. 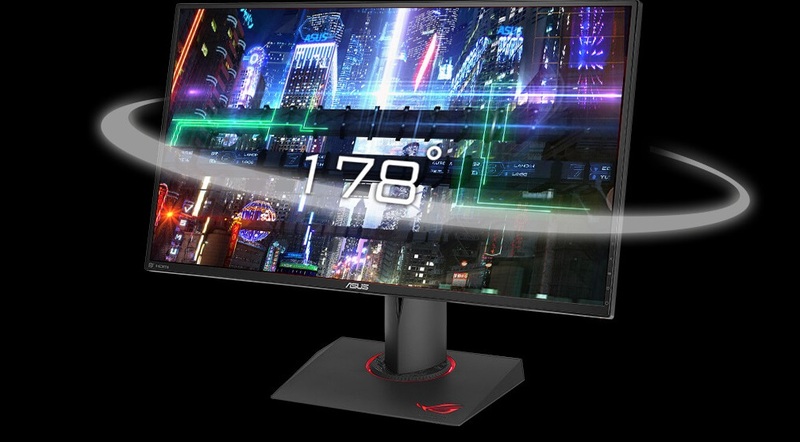 The monitor has a 4K resolution and a 144 Hz refresh rate, but it also has a IPS panel with a higher response time specification than the XB272-HDR. Furthermore, the X27 includes GameView settings with which you can select three alternative aim-points for first-person shooting games. The ROG Swift PG35VQ is also a hotly anticipated monitor unveiled last year that will launch sometime in 2018. 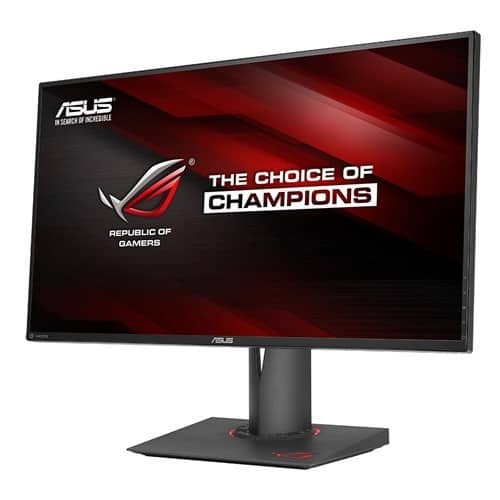 This is an ultra-wide 35-inch VDU with a 3,440 x 1,440 resolution and ultra-fast 200 Hz refresh rate. The PG35VQ is an HDR monitor that supports Nvidia G-Sync. When launched, this will be the new flagship of the ROG Swift VDU range. Those are a few of the best monitors for 2018 that are already out or scheduled for launch this year. 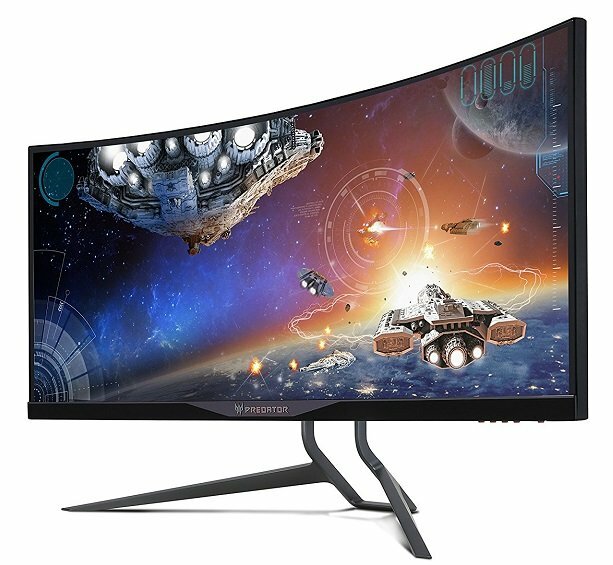 The Alienware 25, ROG Swift PG279Q and Predator X34 are probably the best gaming monitors. However, the ultra-wide ROG Swift PG348Q and Acer XR382CQK are more cinematic VDUs that are great for movies. With a terrific picture quality and various design modes, the BenQ PD3200U is a great VDU for image editing, animation, and design. So go for the one that best matches your requirements.